The witching hour is upon us. 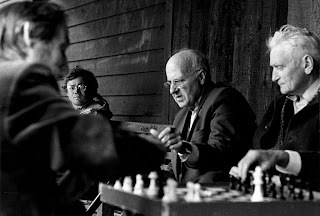 Tomorrow being Halloween - the traditional time for ghouls, demons and all manner of nasties to come out to play, not to mention kids on the street demanding of chocolate with menaces - today seems like the perfect time for the tale of how one of the best chessers the world has ever seen once played a game with a dead guy. Did Viktor Korchnoi (born 1931) really play chess with Geza Maroczy (born 1870; died 1951) during the closing years of last century? It seems unlikely, but, as with all the best ghost stories, this isn't just a yarn that's not just bizarre and hard to believe: there's a macabre twist at the end too. Korchnoi gave his account of his game with Maroczy in the second edition of his biography (Chess is My Life, Olms 2005). Back in 1985, he writes, he was contacted by the president of the Swiss Society of Parapsychology, a certain Dr. Eisenbeiss. The man asked him a direct question: out of the countless masters no longer alive, who would he most like to play? After some consideration, Korchnoi responded with a list – Capablanca, Keres or Maroczy – and a few days later received word that the erstwhile Cuban and Estonian stars could not be located. Geza Maroczy, however, had been found, was up for some chess, and in fact had already made his first move! How does one go about playing a game of chess with a dead person? In this case, Viktor would give his move to Eisenbeiss who would in turn contact a Medium – the mysterious Robert Rollans – who used his talents to get in touch with Maroczy to tell him what Korchnoi had played. When it was time for the dead man to move the chain simply operated in reverse. 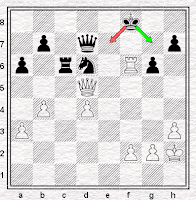 This procedure continued for eight years, the game ending with Maroczy’s resignation after 47 moves. Korchnoi, it seems, never actually met Rollans in person until they appeared together on a German TV programme in 1992. 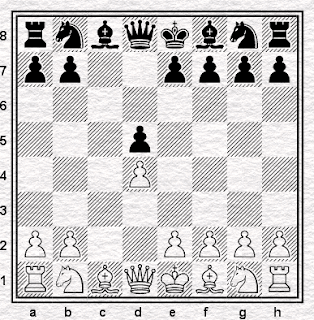 We played a French Defence, an opening where all the subtleties are familiar to me ... [The opening] was played very weakly by my opponent. This is not hard to understand, if it is borne in mind that he had not played for 50 years and that he did not even have a chess set. So it was a very much alive Viktor Korchnoi against a really rather dead Maroczy? 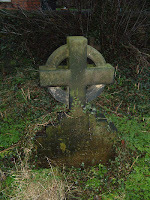 The man himself says that he was “inclined to believe” in the “migration of souls” that would allow such an encounter. Nevertheless, there are, I’m sure, many readers of our humble blog who retain their doubts. The more sceptical amongst our readership will tell you that since Maroczy died in 1951 he was still dead between 1985 and 1993. They will point out that snuffing it – by definition – means one is no longer able to play chess nor chat with corpse-botherers like Rollans for that matter. They will refer you to Occam’s Razor and the likelihood that the evidence (specific details relating to an obscure opponent - Romih - and the Karlsbad tournament of 1929) received from Maroczy to buttress his claim that it was indeed he on the other end of Rollans’ hotline to the After Life, in fact originated from the Medium himself and was obtained from a quite different, and probably much more mundane, source. Fraud, then? It seems possible/probable/likely/certain (delete as you feel appropriate) that somebody hasn’t been entirely honest somewhere along the line. Not that there need necessarily have been any conscious or deliberate attempt to pull the wool over anybody’s eyes, though. In psychic circles there are folk known as Shut Eyes – people who have no special powers or ability to speak to the dead, but fervently believe that they do and can. The game continued for many years - I was very occupied with competitions, the medium was often ill, and he was not in a condition to make contact with anyone in this world, let alone the other one. I was told, Maroczy too was not in the mood to play - he was bored. So, what of Rollans? The real deal? Well intentioned, yet misguided? Harmless charlatan? Vile? We only know him through Eisenbeiss via Korchnoi, so who's to say? I’d love to talk to him about his encounters Korchnoi and Maroczy, but sadly, not possessing his skills, I cannot. 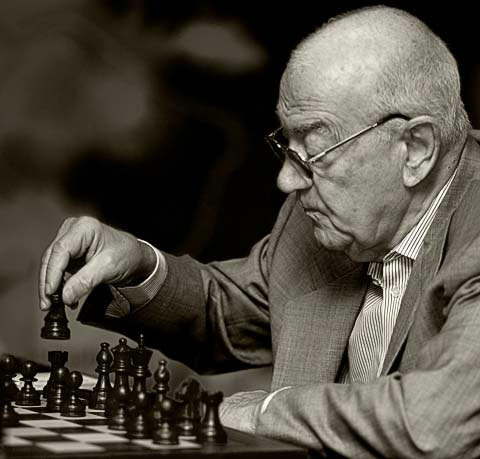 After the best part of a decade of play, Rollans died less than three weeks after Maroczy-Korchnoi had come to an end. 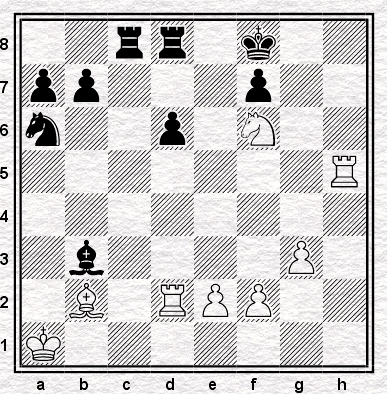 If the position above - White to play - occurred in one of your games, what would you think about it? Would you think "how dull", would you feel contempt for your opponent for playing into such a dull position or shame at yourself for allowing it? Would you offer or accept a draw? Or would you think that this was a challenging, a position, open, asymmetrical, plenty of pieces still on the board, very easy to lose this one quickly if I don't keep my wits about me? Of course you wouldn't. Because this is the Petroff. The position above is probably the most crucial position in current Petroff theory. 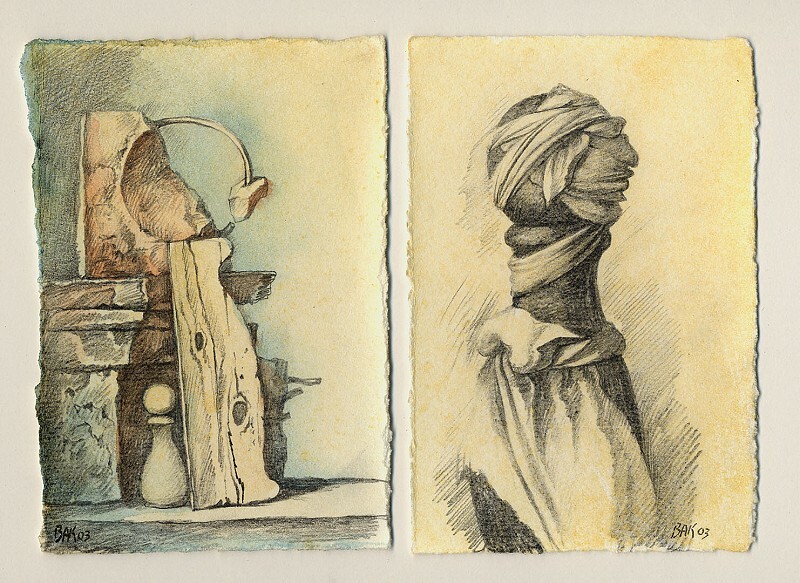 And everybody knows the Petroff is a drawing opening. Unless they actually look at it. It cropped up in Nanjing, on Wednesday, in the game Gashimov-Wang Yue. Naturally it resulted in mass exchanges and a draw. 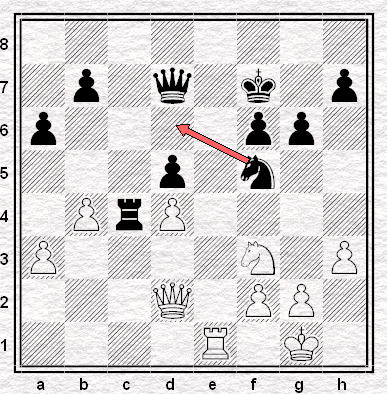 In fact everything was exchanged until they got right down to the bare kings, and a draw on move 66. It's not a battle royal or masterpiece, it's just a hard-fought grandmaster game like any other, in an opening like any other. Except most openings don't get talked about as if their employment was a sign of moral turpitude, or as if they represented a threat to the existence of the game rather than just another way of starting it. Me, I like the Petroff. I've always liked it, ever since I saw David Hooper's Complete Defence To 1.P-K4 on my father's shelves when I was young, the first opening book I can remember seeing. In my beginners' books - and of course in my beginner's games - you only ever saw 2...Nc6, and so for me 2...Nf6 was from the start something new rather than something dull. It was something different, clever, off-the-wall. What's wrong with it? It copies. By copying, it annoys. When you were a kid, did you ever annoy anybody by copying exactly what they did? I still do this, as it happens, and I'm 45. Don't! "Don't!" Stop it! "Stop it!" It's enough to get anybody's nerves, and for a chess opening, that's a start. It gets on people's nerves, the Petroff. I like that about it too. But they say it's boring. It's not like the sort of game you get from the Semi-Slav, for instance, where lines like 1. d4 d5 2.c4 c6 3.Nf3 Nf6 4.Nc3 e6 5.Bg5 lead to the most fantastic complications. Lines favoured by players like Topalov, who like to like to sacrifice their knight on f7 as early as possible, as in Topalov-Kramnik, Wijk aan Zee 2008. Or do I mean Topalov-Kramnik, Linares 1999? It's so hard to tell. I mean, let's go back to that thrilling, mind-boggling Semi-Slav line again. Suppose White had deviated a little earlier, specifically on move three? What was Black going to do for winning chances after 3.cxd5? (As it happens, even 5.cxd5 can be hard to play against, but let's keep this simple for the moment.) Horror! All of a sudden, instead being in the thrill-a-minute Semi-Slav, we're in the handshake-in-a-moment Slav Exchange. So whose fault is that, assuming the language of blame has any relevance at all here? 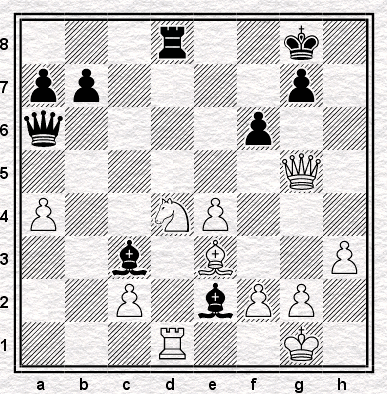 White's, presumably, for taking on d5, since we've already established that Black's up for a fight if White wants one. But in that case, isn't the same true if White plays for a draw in the Petroff? If this doesn't seem quite right to the club player, it may be because the relevant drawing variation in the Petroff is much more drawish, at club level, than its Slav equivalent. I'd have a little bet, for instance, that the most common result at club level, in the Slav Exchange, is a win for Black, since it's most commonly employed against the higher-graded by people hoping for a draw. I've not seen the statistics on which I'd base that bet: I have, however, seen it happen any number of times in club and tournament games. It's not a strategy that tends to work. and after 5...Qe7 6.d3 off the queens go early doors. Not quite as drawish as Gashimov and Wang Yue's bare kings, of course, there's still a game to be played, but if you were trying to win a game, you'd rather take the Slav Exchange, wouldn't you? I don't think I've ever - unlike the Slav Exchange - seen this on a real-life chessboard in a serious game. Maybe at club level nobody ever has this position, because they avoid the Petroff in order to avoid it. Fair enough: I'd do the same. But it doesn't follow that when somebody plays the Petroff as grandmaster level, they're doing so because they're inviting the opponent to play right down it. On the contrary, it's because they're assuming the opponent won't. If Kramnik plays 2...Nf6 against Topalov, it's because he's got every reason to think Topalov is going to play something more testing. And if Topalov isn't in a mood to play, he's going to play down a drawish line no matter what Kramnik does. Because, at the highest level, what makes the game hard to win is not that you're playing the Petroff. It's that you're playing Black. But at that level, you don't normally waste a White. Or, for that matter, waste a draw offer if you've got Black and you get one nice and early. That's the draw-hating Topalov who favours the Berlin Wall, by the way, which as much as anything points up the absurdity of attaching moral criteria to openings when played by super-grandmasters, or indeed of attaching them to preferences of style and approach. If it's true that the Petroff is an unwise choice against the lower-rated player, because it makes it too hard to take advantage of your strength, it doesn't mean it's a cowardly choice when employed by a top ten player against another top ten player. It just means you - you, not them - shouldn't play it when it isn't suitable. Play it against the better players, pick something else against the weaker ones. This doesn't fit with the practice of most ordinary players, since we like to concentrate on playing just the one defence. But it's viable, if the openings are sound and you play often enough. I don't play it myself, not at the moment. I gave it up as a kid - stupidly, for Sicilians about which I understood nothing - and then played it a little again in my twenties, until a game against Adam Hunt when, a few minutes before we played, he looked up what was then troubling the Petroff most, rolled it out and rolled me over. That was about fifteen years ago. I've not played it since. But I would. If everybody played 3.Nxe5, which right now nearly everybody does, I'd play it now. But it's 3.d4, the move that Adam chose, that I've never been happy against. Only that. If not for that, I'd play it. And if other people don't like it? So much the better for that. I've been following the chess offerings on Etsy, the homemade, handmade, arts &/or crafts internet seller, so you don't have to! Here's a few recent additions that caught my eye . . .
What can I say? 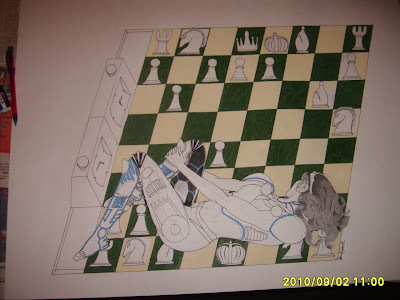 I don't think I can beat the seller's description: "This is a rendition of a chess strategy with the queen embodied as a Female in a futuristic like outfit laying across the chess board. "And I'm not surprised white is down on the clock here. Only $220. I think I know how to make chess more popular. 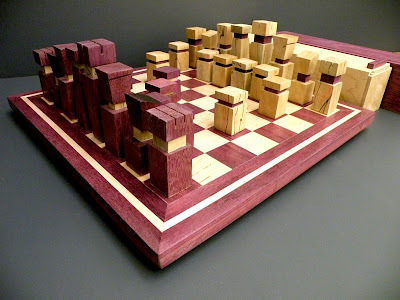 A giant chess board with people for pieces, the only way to know who is which piece is by their . . .
Maybe I'm not very good at teh interweb, but that doesn't look handmade to me? Non-traditional colours? Non-Staunton shapes? White not on the right? Gosh, I should hate you. But you look so good! I would change our conventions for you. And that's it for today. 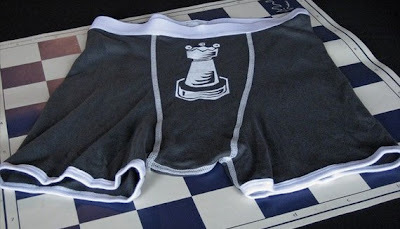 If you missed my first post about chess stuff on etsy, you can find it by clicking here. The position is now objectively drawn, but I was very determined to win. My long-term plan consisted of winning the a-pawn, winning the bishop for my pawn and, eventually, winning with rook and bishop against rook. Let us evaluate the position. I will not win the a-pawn, I will not win the bishop and, even if I did, the position would still be a theoretical draw. That would be the objective evaluation. 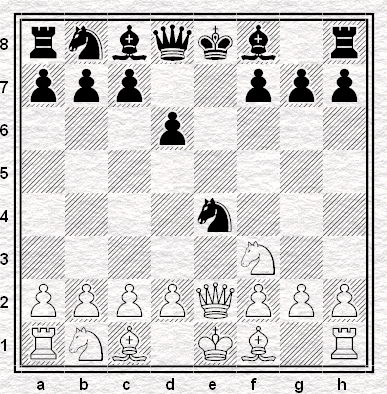 The best that White can get is the theoretically drawn ending of rook and bishop against rook. Nevertheless, this would offer some practical chances, but it soon becomes apparent that even a symbolic triumph of this nature is beyond the capacity of White’s position. 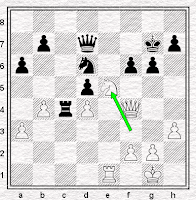 ... but nevertheless it was a full thirty moves before Vik agreed to split the point. Here the game was adjourned for a second time. Korchnoi has made no progress in the last twenty moves but now had a chance to consult reference books and analyse the position thoroughly … Alas they merely confirmed the position was a draw. ... yet once again it was another thirty-odd moves before the game ended. 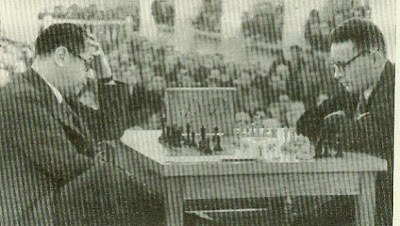 The position is now a book draw but, unperturbed by snoring from the audience, Korchnoi plays on for another fourteen moves before bowing to the inevitable. I'd include an example from my own games at this point, but I don't have one so I can't. There's a moral for me there, I think. Every Picture Tells A Story: And This Is Where The Story Begins. Blog 1. For the full sequence of posts in this story, please click here to get to the Index. This is the start of a story, a story about a journey in search of a picture. It is a fine picture, though not perhaps a great one, and it has a lot to say. In the episodes that follow we will reveal the facts we have discovered about it (and some speculation as well) and the adventures we have had along the way. We begin in 2008. 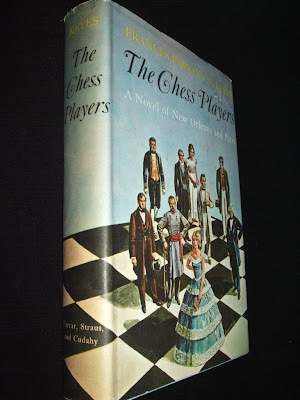 Richard Tillett, my fellow sleuth from the Streatham and Brixton Chess Club's Department of Obscure Chess Pictures, is rummaging in a junk shop in West Norwood when he spots an out-of-print book on the history of interior decoration. 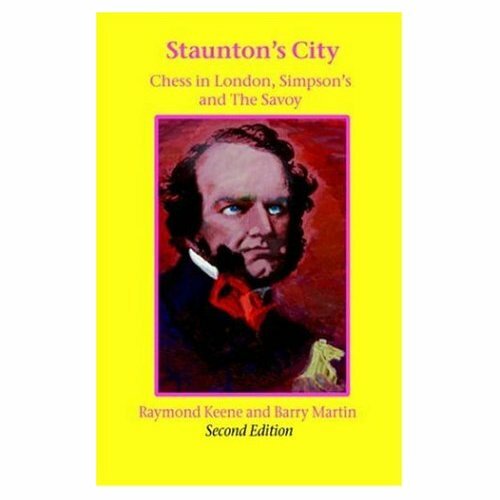 It has some pictures of 19th century interiors with folk playing chess. And it's only five quid. Out comes his wallet. Back home one particular picture grabs his attention. 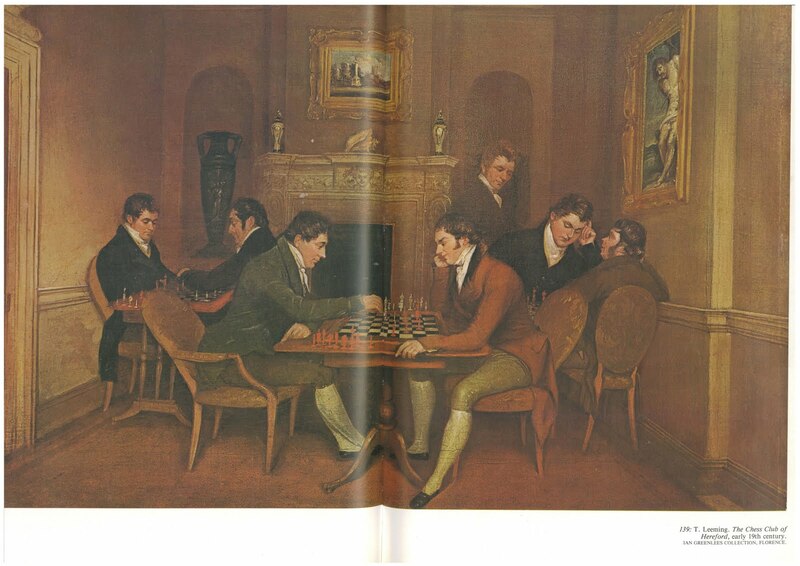 It shows a group of English gents, straight out of Jane Austen, sitting together playing chess. There are three games in progress, and a seventh figure stands apart observing one of the games. 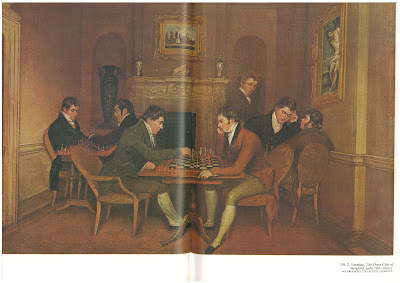 Pride and prejudice - not a chess picture and only one gent. Richard wants to know more, but a quick internet search reveals little. No references to the picture or its present location, and next to nothing about the artist. The picture and its painter seemed to have vanished from the record. Fast forward to a cold winter's afternoon in December 2009 and a small café by Clapham Common in South London where, as some local people will tell you, they used to play open-air chess. Chess on Clapham Common in 1986. It is here that Richard introduces me to the picture. Egged on by fellow blogger Jonathan B. we wonder why chess-in-art aficionados haven't noticed it before. 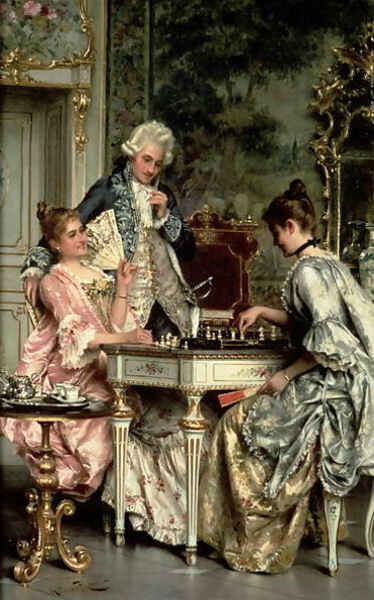 Maybe books on interior decoration are not the first place they would look for chess paintings (being more inclined, if their thoughts ever turned to interior design, to reach for the latest IKEA catalogue). This is our picture as it appears in plate 139 of the book, An Illustrated History of Interior Design: From Pompeii to Art Nouveau by Mario Praz (Thames & Hudson, 1964 reprinted 1982). It's not a very good reproduction because we've had to scan it from the book (with apologies to the publishers), but more images of the picture will follow. The picture extends over two pages - hence the weird bit in the middle. To help with the detail, here is the text box. 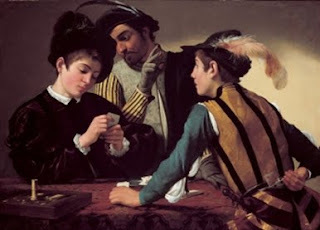 As we sat warming ourselves on our Grand Lattes with extra chocolate, the questions flooded in: what more could we find out about the artist, could we find the picture and see it in the flesh, who were the chess players, why was it painted? Our answers to these, and all the other questions we didn't then know we would ask, will be revealed in a series of occasional posts over the coming weeks and months. This has turned into a substantial research project. We have scoured the internet and consulted many people who share our fascination with this picture. 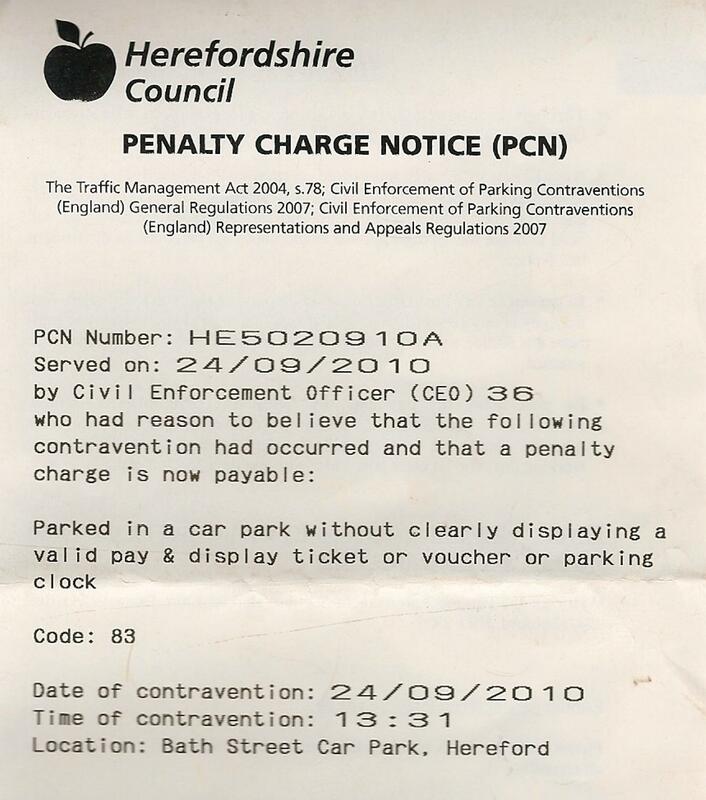 We've travelled far in our quest and we've got a parking ticket to prove it. Richard even attended a proper auction, with a bloke with a gavel, as part of our adventure. Many questions remain tantalisingly unresolved, and we are hoping that answers will emerge as time goes on, because the story is still unfolding as we write. This is a collaborative effort, involving many people, and we will be acknowledging their contributions. Our next instalment will follow soon. Pride and Prejudice illustration by Hugh Thomson to the novel by Jane Austen ca. 1894. It depicts the Bennet family at home. Sourced from Wikipedia Commons. Chess on Clapham Common photo by kind permission of Billy Rizcallah. Thames and Hudson for the picture from the Praz volume detailed above. 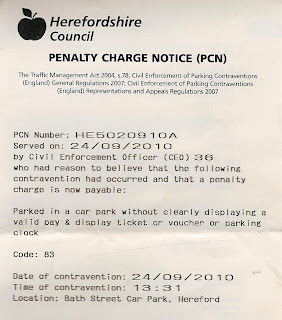 Herefordshire Council for the PCN! And thanks also to them for cancelling it when we pointed out we had paid for the parking, but the ticket had blown off the dashboard. Last season, I lost two games out of the twenty two I played. This season I've played two games - and lost one already. Clearly, then, not a good start, and against a lower rated opponent too. On the other hand, I told myself cycling home after the loss, I have in the past blundered terribly at least once per season - and so I was due one. Overdue one, in fact, since my losses last season were games where I was pretty much outplayed. Plus it was the kind of blunder I've suffered before: involving a rook to king's sixth, my own weird blind spot. And my opponent implicitly agreed, didn't he, that I was unlucky, that his win was a lucky last minute break in a lost position? "Sorry," he said abashedly, as I held out my hand to resign. I mumbled a few words about how, yes, I really thought I was a bit better throughout the game. He apologized again - and each commiseration from team mate included a comment along the lines of "weren't you better there? quite a lot better? a piece up at one point?" I played 38...Qe7, overlooking 39.Re6 which is easily winning in all lines for white. I thought my queen move was a little finesse, an improvement over the immediate 38...Rb6, which was also surely winning after 39.Rf8+ Ne8 40.Qb8+ Ke7 and the checks run out. Don't they? Alas not - I realized the next morning that 41.Rxe8+! 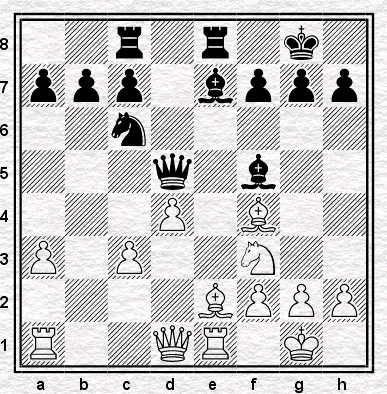 nets white a pawn, although the resulting queen ending may be hard to win in practice. But in fact all this is unnecessary. After 38...Rb6 in the diagram above, white has a much more direct and immediate win - which I leave the reader to uncover, the first test. So: where did black go wrong? 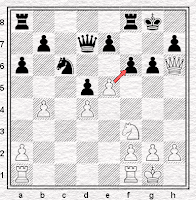 If you played through the game, probably you sensed that after 17.exf6?! 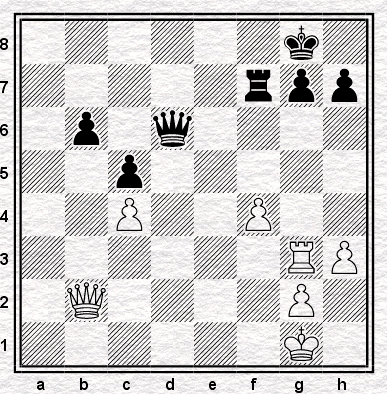 white is fundamentally, but very slightly, worse: he has a weakened queenside that he will be tied to the defence of. And equally at first glance you may suppose that 31.Ne5 looks like a rather desperate shot to complicate matters. But this intuition is wrong: 31.Ne5 is good enough for a draw, which white is surely correct to take . . .
. . . not the least because if black tries to defend to win, he may lose instead, as happened when I played 36....Ke7?? - instead 36...Kg7 should eventually lead to a draw. So why did I play 36...Ke7? Well, I misanalyzed the resulting position. And the cause of that? I think because I assumed I was winning. Hadn't I been very so slightly better for most of the middlegame? Wasn't 31.Ne5 just an attempt to confuse matters? Therefore, a win must be there, waiting to be found . . .
Congratulations if you sensed that correctly - I had no hunch whatsoever until Rybka showed me otherwise. 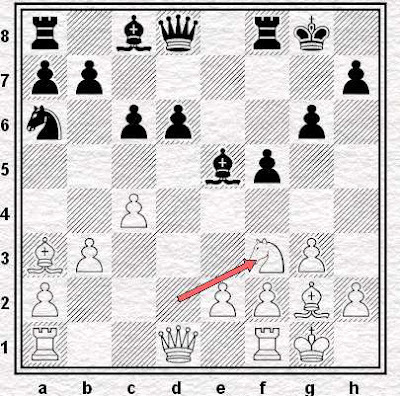 In retrospect I could annotate this along the lines of "black's knight maneuver is too ambitious - with a weakened kingside he must be ever vigilant against tactical shots, so should take a slower approach", but what is curious is that my thought processes couldn't have been further from this at the time. My pieces were gradually taking up great positions against the white queenside. 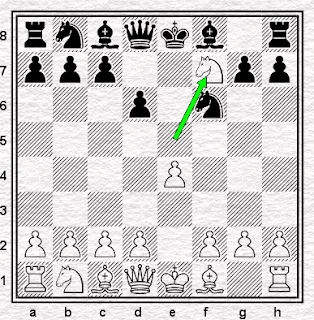 How could his pieces - getting nudged defensively this way and that - suddenly cohere into an attack? Still, it seemed to surprise my opponent and our teammates just as much. Perhaps it just goes to show that amateurs shouldn't suppose to win games through the accumulation of small advantages: we're not subtle enough. But I certainly feel like I learnt something from this loss, that much I do know. After my opponent apologized for the second time, I managed to say that he had nothing to say sorry for. True, but in retrospect an understatement. I should of course have just said: "Congratulations! Well played!" Musicals. There are two things about them that I find interesting: the fact the phrase “a fan of musical theatre” is, in certain circles, employed as a euphemism for homosexual tendencies (not, as Jerry Seinfeld would tell you, that there’s anything wrong with that) and the apparent convention that this form of entertainment should not take as its subject matter anything that isn’t straightforward to present and already rather familiar to its audience. It is the second point that is of interest to us today. Six months ago I wrote about the position of chess in the popular culture of the 1970s. The prominence of chess in news reports back then never ceases to astonish me. Can you imagine that The Times would cover Vishy Anand giving a simul with a front page report today? Well, they gave Karpov one on 15th August 1977 after he'd played 10 juniors in London. This kind of coverage linked the game with the on-going ideological struggle between the Western Democracies and the Eastern Bloc countries and, whether they liked it or not, brought the game into the lives of non-players. 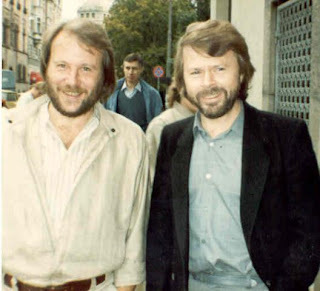 No surprise, then, that when Tim Rice, Benny Andersson and Bjorn Ulvaeus decided to make their musical about our favourite game they, like the Manic Street Preachers and their current video, chose to focus on chess from the Cold War era. The Rice-Andersson-Ulvaeus triptych’s show borrowed a great deal from the chess world of the 1970s. The cast of characters includes an American, a Russian, a defector and a KGB colonel for a start and the story features matches for the World Championship played in Merano and East Asia (Bangkok, admittedly, rather than Baguio City in the Philippines). They haven't got that chessboard quite right, have they? Chess: The Musical was a huge success and ran for a few years in London in the late 80s. I remember enjoying it a great deal when I went. Indeed, if memory serves, I not only bought the soundtrack (on vinyl – younger readers may be interested to know that we used to listen to music on things called ‘gramophones’) I also went back to see it live more than once. I was very pleased, then, to discover that it’s touring once again and am indebted to an industry insider who kindly sent me a copy of the luvvies' trade paper The Stage of 2nd September which carried an interview with the producer, a certain Michael Harrison. While the re-appearance of chess on stage can only be a good thing for chessers and theatregoers everywhere, there’s one aspect of The Stage’s interview that I found rather strange. 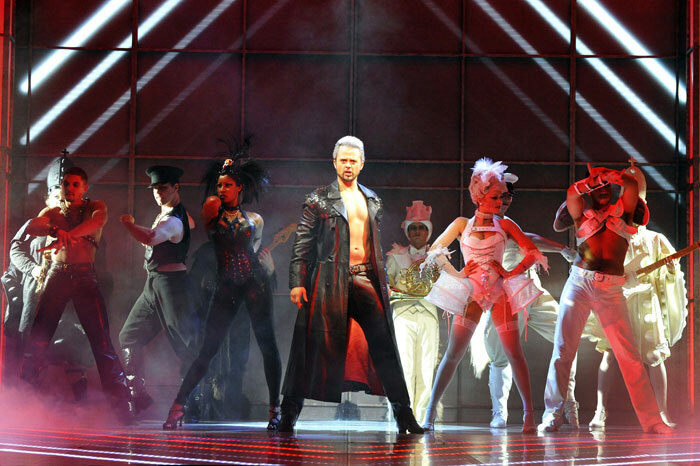 It’s the part where Harrison talks about his collaboration with choreographer Craig Revel. Apparently this Revel fellow is, “instantly recognised for his contributions on Strictly Come Dancing”. Well, not by your humble scribe he wouldn’t be, but, no matter, let us get to Harrison’s point. … I had a conversation with Craig about the work he was doing and we looked for something we could collaborate on. Chess came up – he’d previously done a very successful production in Denmark about ten years ago, which I’ve seen the DVD, and is great. It’s very Craig – very sexual, very on the edge, and focused on the story of the relationships, instead of the game of chess or the Cold War that it is set against. This, it would seem, is what attracted Michael Harrison to the project. He wanted to do a musical that was called Chess, that had been written about chess, but that would, if he could manage it, include as little chess as possible and ditto for the geo-political climate of the time. Capitalism won and now these two are bigger than chess. Happy now? Now, I dare say Mickey – “managing director of Qdos, still the country’s biggest panto provider ….” - knows his business much better than I do; I’m quite sure that he knows what he refers to as “audiences in the regions” want, or at least what they will pay to see. Still, it strikes me as somewhat odd to want to strip away everything that makes your show different from every thing else out there; rather a shame to launch your production only after glossing over everything that makes it unique. Why not call it “Relationships: The Musical”? Why do it all? The answer, I suspect, comes a little later in the interview. It feels right to do chess now … [we’re] post-Mamma Mia! Now – the influence of Abba in the theatre is huge. That is no doubt why the plan was not to tour the show with any stars in the cast. The big names on the posters would be Tim Rice and the aforementioned, Andersson and Ulvaeus. The fella in the middle is the Arbiter. So, in contrast to the original, the Chess: The Musical revival is not about chess: the game at all. Again, this is probably to be expected. The Cold War is so three or four decades ago and the game just isn't news any more - but Abba and Strictly Come Dancing are. Little nuggets like this tell us a good deal about the general appeal of chess now compared to 30-40 years ago, but what will the change do to the show itself? When asked about the prospects of a West End run to follow the tour of the regions Harrison does not make it sound likely. … I’m not restless about the fact that I’ve not produced in the West End yet. It’s got to be the right thing – I want to come in with something that’s both artistically and commercially successful when I do. Fair enough, but, since he’s already said he expects his tour to be a commercial success, is that him saying he doesn’t consider it to be an artistic triumph? Whatever. The original was a good show and I’d be surprised if the new version - concentrating on the relationships or otherwise - isn't a fun night out for anybody who gets to see it. If you’re anywhere near Sheffield this week, or Salford next week, or Cardiff, Bradford, Southampton, Nottingham, Norwich or Plymouth do pop along and let us know what you think. Farder Coram was a chess player, and he knew how chess players look at a game in play. An expert player seemed to see lines of force and influence on the board, and looked along the important ones and ignored the weak ones; and Lyra's eyes moved the same way, according to some similar magnetic field that she could see and he couldn't. I often tell my students that good players are like monsters from horror movies. You can shoot them and stab them but they won't lie down and even after they are confirmed dead they keep coming after you. So never relax! Monday 11/10: decided to do Friday's post on the theme of the Simen Agdestein quote as above. The usual setting for these 'swindles' is when the winning player plays what he thinks is the obvious winning move. It's when the under 2000 player is at his most vulnerable, jumping that last hurdle. At least I know I'm not alone, but, really, I do this sort of thing far too often. Could be worse, I suppose: I should have lost at the end there after all. TISE (not TIFE) is a post I've been trying to get around to writing for about three or four months now. Ever since I wrote One for Tom, a post based on a fine attacking game by Jacob Aagaard, I, like T.C., have become increasingly obsessed with exchange sacrifices. Since June I've written a few posts on the theme of giving up a rook for a minor piece. There was RCP VI (Raymondo giving up material to grab the light-squares); RCP VII (which included the game Wade-RDK, a battle which contained a defensive exchange sac that helped our hero with the British Championship); A Collection of Dutch bits and bobs (two sacs from Simon Williams' DVD The Killer Dutch); and I was planning a post on Petrosian's wonderful sac against Reshevsky from Zurich 1953 too but EJH got there before me (My favourite moves XII). The more I look for them, the more I discover there are so many different kinds of exchange sacrifice. Perhaps, like eskimos finding the need for a gazillion different words for snow, chess players should invent a few new terms to be able to distinguish between the various ways exchanges can be given up. Shirov-Bareev, Lvov Zonal 1990 features two very different exchange sacrifices from the (then) Latvian soon-to-be SuperGM. Dissimilar, but both archetypes; both good examples of a certain kind of exchange sacrifice. In his comments for Grandmaster Video, Shirov says that he'd originally intended 13. Rc1 but then came to believe that it wouldn't give him any advantage. This was a game he had to win, so he chose instead to mix things up by giving up a rook to get Black's powerful bishop off of the board. Obviously, 13. Nf3 is a purely positional sacrifice. Shirov has no intention of regaining the material in the foreseeable future, nor is he gaining chances to attack Bareev's king. It's a funny kind of sacrifice in that it only takes a glance to see that there will definitely be compensation based around White's dark-square play and Black's draughty king, but judging whether there will be enough is fiendishly difficult (impossible, actually, if you're me). Twenty moves later Shirov gives up rook for bishop a second time, or would have done had Bareev not declined the material (with a counter exchange sac, no less). 33. ... Kxe6 would have led to a position in which Black was two exchanges for two pawns ahead, but he spurned the sacrifice because of a specific tactical sequence that would have led to immediate disaster. Two very different kinds of exchange sacrifice, then. The first is a question of judgement: a decision informed by variations, perhaps, but ultimately the kind of move you make without knowing for sure exactly how the game will go. The second, however, has a concrete solution: 'if he takes the rook with his king then x, y and z follows and I win'. That's the theory, anyway. I didn't fully understand the positional judgement behind the first ex sac and I couldn't find the winning line for White after 33. Rxe6 Kxe6 either. I'm sure, however, the S&BC Blog readership can do better. 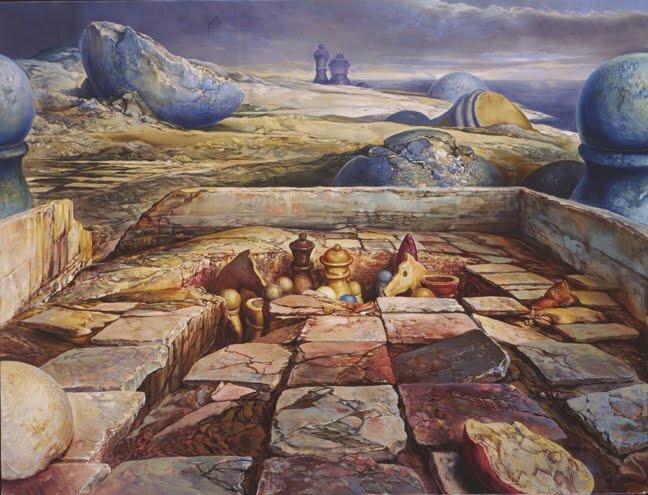 Is it possible to tell from a chess-in-artwork whether the artist is a serious chess player? In some the chess looks incidental, just a convenient hook on which to hang a stereotyped metaphor, or a prop to hold up a parlour piece. Real players will suspect that artists such as this wouldn't know their a pawn from their b; they might just have well have shoved in scrabble. Or snap. Other artists are obviously chess-savvy. They portray serious players playing chess seriously; they render the game respectfully and accurately; the game may even itself be the subject, with players surplus to requirements. And, as often as not, they work in series. Good examples, from earier posts, are Dominique Digeon and Nicholas Sphicas. 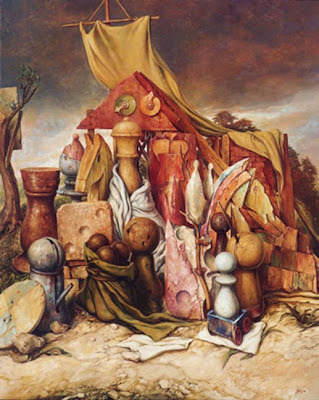 Another chess-in-artist who adopts the same intense focus, dispensing with people, and insistently revisiting his theme, is Samuel Bak, born in 1933. The Game Continues - chess in the art of Samuel Bak (1999) by Lawrence L. Langer illustrates 52, yes that's 52, chess-in-artworks by Bak, all dated 1998, to which you can add another 60 or so given by Scacchi e Arte dated between 1990 and 2003, including a series of eight water-colour studies demonstrating that Bak, anyway, could tell apart his pawns. That's well over 100 chess themed art works. Which is a colossal output, all the more remarkable because, at the time, he wasn't a chesser. But, he had form. In the foreword to the Langer book Bak says that his step-father "was involved in the world of chess. Mythical names of chess champions like Botvinik (sic), Lasker and Capablanca were on his lips whenever he tried, with very poor results, to turn me into a chess master." Which explains where the chess came from, sixty years before, but not the why, and the now. 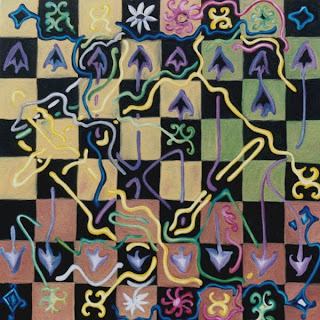 So, why does Bak do chess-in-art? Because, to attempt an answer on his behalf, he can use chess to represent and evoke struggle, the struggle for survival. Struggle against an unyielding foe: this is the aspect of chess that serves his purpose. Bak uses chess to metaphorise (if there is such a word) an unimaginable episode of his early life: the ghetto in Nazi-annexed Poland, the Holocaust, and post-war displacement. 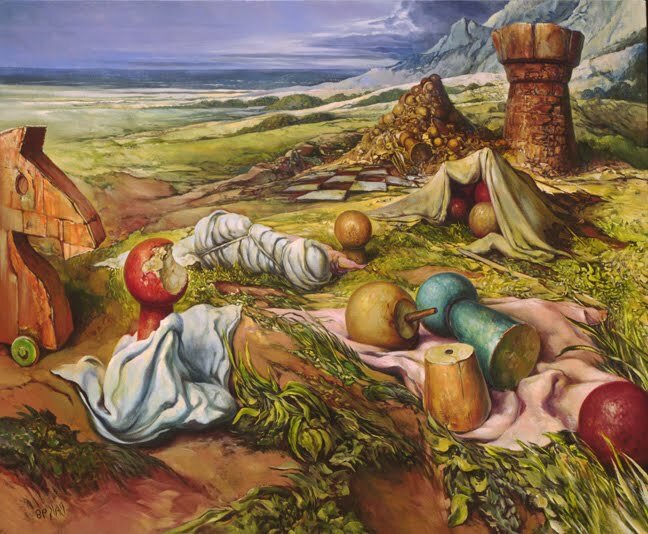 These childhood traumas are refracted into his art through the prism of chess. For me, the sheer volume of this therapeutic, expurgatory, didactic chess-in-holocaust-art is a bit much to deal with. Langer, and others, help by unpicking in some detail the meaning of it (see notes). Let's just focus here on some of the pictorial devices that Bak employs. Firstly, there is the antique, medieval mise en scène congruent with the characters in the chess set: the knight, the queen, the king, the humble pawns etc. They inhabit fortifications and emplacements, and adopt the paraphernalia of war and oppression from the Middle Ages (though occasionally, and ahead of its time, you see artillery up-standing). This time-frame hints at the familiar image of chess as courtly dalliance - all be it with a large helping of irony. Next, there is the landscape: ringed by the flat horizon only, barren, wind-swept, tree-less, riven and fractured, where hooded hordes stumbling in cracked earth wreak havoc, careless of Geneva Conventions and collateral damage. Or they loom. Ominously. 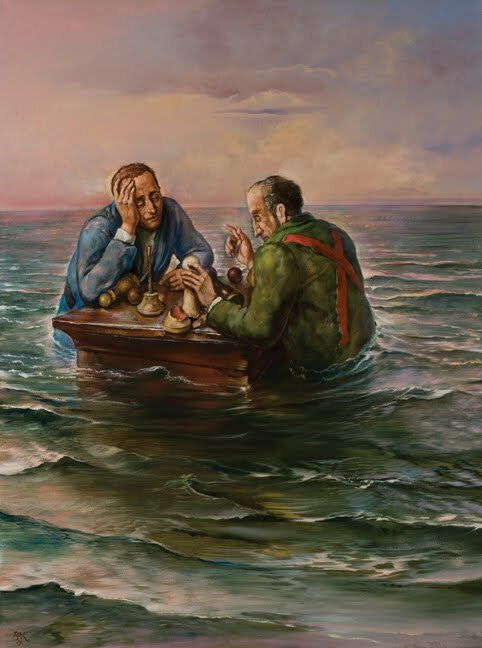 Then there is water: unusually in chess-in-art Bak features boiling seas, deluges, inundations; or, as below, a calm before or after a storm. And then there are the de-individuated pieces. Seldom do they have specific personalities, or expressions; rather, they take on human characteristics through costume or, and with greater effect, by attitude and body language. Finally there is the hyper-realist gloss, occasionally using Dali-like optical tricks and plunging perspective, supported by mildly punning titles (something your Streatham and Brixton Chess Bloggers know a thing or two about), all of which combine to add to the effect of alienation: you get it, but you can't identify with it. And maybe one wouldn't want to, because nothing nice seems to happen in Bak's troubled world. The good times stopped rolling some time ago; no-one ever cracks open a bottle, strikes up a tune, and has a knees-up. The warmest emotion is to be found when huddling together in fear, or in the fleeting conviviality of a clandestine meeting. And that must be how it was. I don't think I like Bak's work: its obsessiveness; its hermetic inwardness; its metaphorical one-dimensioness; its relentless persistence; its rhetorical repetitiveness (something else your S&B Chess Blogger knows something about). This not to seek to invalidate or trivialise the experience of which he bears witness. But he is an artist whose vision seems to be locked on to, or in by, that experience. Like a tractor beam it inexorably drags him back. He can't see any other way. Maybe, though, the title of Langer's book suggests some hope: "The Game Continues". All is not lost. The picture below, dated last year, shows some real people in modern garb trying to play the game on their own terms; that's really, not metaphorically. They stand on the bottom. The flood is draining. Not drowning, maybe they'll soon be waving. Lawrence L. Langer (1999) The Game Continues - chess in the art of Samuel Bak. Pucker Gallery, Boston. 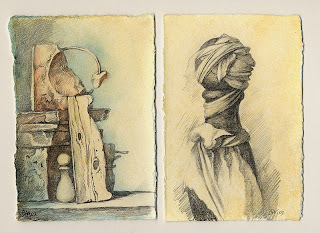 All the Bak works in this post come from the Pucker Gallery. For extended discussions of Samuel Bak's work, and more examples of his pictures, go to the Centre for Holocaust Studies, Christos Kefalis blog on the Chess Theory site, and the Pucker Gallery. "Ringed by the flat horizon, etc." comes from T.S.Eliot's Wasteland, referred to also by Lawrence L. Langer in his commentary. "Waving" needs no explanation. Wednesday's position was from Tringov-Korchnoi, Skopje Olympiad, 1972. Bulgaria v USSR, board two, fourth round of the Final A Group. Tringov was forfeited under dubious circumstances as the scoresheet with his sealed move was lost. In a quite respectable position, against Korchnoi, the Bulgarian grandmaster sealed (he thought) his move, and adjourned for a night of analysis. Next day he found what he'd got was an empty envelope. The day after, after an agonizing search, he found the errant score sheet tucked in a jacket pocket. Understandably, he was too embarrassed to tell his team mates. ...the following morning the adjourned position was set up. The envelope was opened and the score sheet removed but when the arbiter looked to find the move that Tringov had written down it was nowhere to be seen! On a closer inspection of the envelope it was discovered that it was not even Tringov's game score but that of his opponent. The only thing that was normal about the whole situation was the envelope, clearly written in Korchnoi's hand, which was undisputedly the same one that had been handed to Tringov the previous evening. ...Various possible explanations were hypothesized. A few of the more evil-minded players suggested that because of their poor start in the finals, the USSR were taking steps to ensure that they did not lose any more matches. Others thought that the arbiters had lost Tringov's score sheet and didn't wish to admit their folly. It was not until 2.00 am on the morning after the closing banquet that we first learned the truth from one of Tringov's team mates: he had indeed written down his move on his score sheet but had absent-mindedly put the score sheet in his pocket. When, a few days later, he discovered what he had done he was too ashamed to admit it to the organizers. Bulgaria lost the match 2.5-1.5. From an international event in the 1970s. Position after Black's 41st move. Horton-Salas Calvo, Ciudad de Huesca tournament, September 2010, round five. 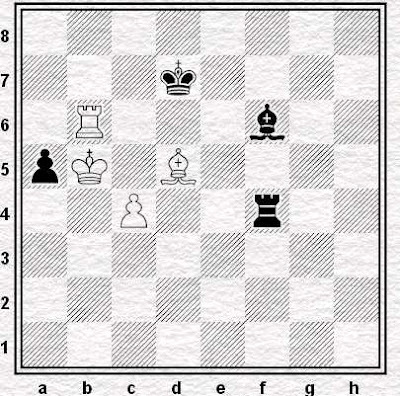 Position after 32.Rh1xh5, capturing a pawn. White would obviously like to put the bishop on f6 and after 32...Rc2 he continued 33.Rxc2 Bxc2 34.Nd5. 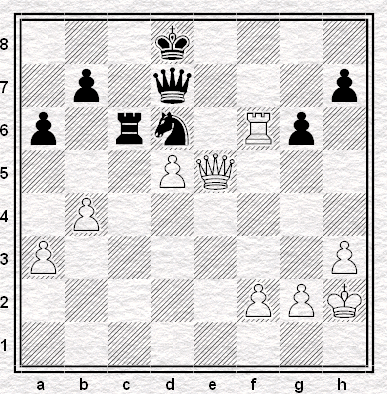 However, after 34...Ke8, as played, the tactics don't work, as if 35.Bf6 Black has time for 35...Rc8. So, remembering Kasparov's 39.Qg4 nothing-move from 1993 (though Black was not pushed for time) White threw in 35.Bd4 to throw the onus of sorting out the position on to Black instead - and indeed, after the unfortunate 35...Kd7 36.Bxa7 Ra8 37.Nb6+, he was in receipt of a fortunate point. But in the above sequence, what did both players miss? Gómez Zazurca - Horton, Ciudad de Huesca tournament, September 2010, round two. Position after 27...f7-f6. 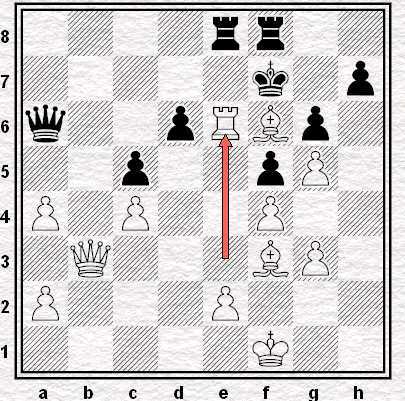 Play now proceeded 28.Qc5 Bxd1 29.Qxc3 Qxa4 30.Nf5 Qxc2 31.Qb4 Rd7 and Black had enough to win. PARKER and FORMAN are bending over paperwork. There’s a knock on the door, and TULLY comes in. He has GORDON’s chess files with him. You wanted these back. They’re Gordon’s. I didn’t mean to bring them in personally. No, but there’s something I have to tell you… (holds out files) I’ve spent a long time seeing how he plays chess. The fact is he’s exceptional. Much more than exceptional… Chess up at this level, it’s difficult to explain. But with the thousands of variations at any one given moment… (simply, matter of factly) … When a person moves, it gives you the deepest look possible into their mind. … Are you saying what I think you’re saying? A pause. Then TULLY again speaks matter-of-factly. I don’t know how he managed it. But for my money, yes, he’s the one. FORMAN dismisses it out of hand. No, he’s clean. We’re not interested in him any more. Which is why he’s coming in to pick up his stuff. Sadly, Grandmaster is not available on DVD now. 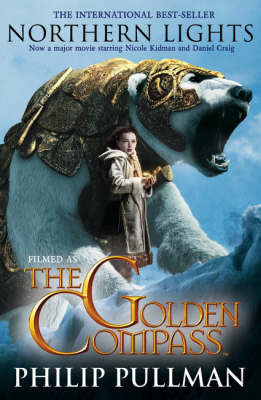 Even if you can't see it, you can read the opening sequence here. Amazon will tell you that the script is "temporarily" out of stock, but I suspect it will not be available to purchase any time soon. Karpov's votes came mainly from European countries. Well, stone me. How surprised are we supposed to be? I mean, given that Karpov and his chums couldn't have made it much more clear that only Europe matters if they'd actually made it their campaign slogan. So, the least trustworthy gang in contemporary chess were able to defeat the second- least trustworthy. 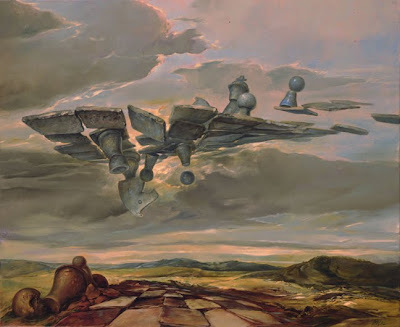 I suppose that in some kind of parallel chess universe - and not one in which the game has been devised by aliens - it would be possibly to reflect thoughtfully on the reasons for the defeat, notably that the mistakes of the Bessel Kok campaign were treated as if they were virtues. But that universe would not be very parallel to this one. Loud were the shouts of anguish and louder still the cries of incomprehension, which were not all that surprising given the widespread absence of critical thought that had accompanied coverage of the defeated campaign on its way to its inevitable defeat. And sure, if your candidate is perfect and your campaign the best that can be imagined, what other reasons for defeat can there be, other than skulduggery and injustice? Loudest still, perhaps have been the shouts for secession from FIDE, from more than one party, in the days after the defeat. I have seen something like this coming for some time (hence my remarks, in the piece linked to above, regarding Kasparov's sudden closeness to Carlsen) and they are the logic of the rhetoric of Karpov's supporters. If what matters in chess is only the top players and the European countries, why not break away? Kirsan would provide the perfect excuse. No more costly Olympiads, no more tiresome pretence that we care about chess development beyond its European (and no doubt North American) frontiers, no more catering for Harry Golombek's polar bears and penguins. Though not all penguins would be excluded. It would be a stupid and a venal move, something which, in itself, is unlikely to deny it a hearing. One imagines that the election of comedy-villain Silvio Danailov as ECU President may militate against Europe speaking with a single mind, which is something at least to be grateful for. Though then again if he were to be in favour he would no doubt be presented in a completely different light in the Oceania-has-always-been-at-war-with-Eurasia style of which Anatoly Karpov was the most recent beneficiary. We'll know when he starts appearing on platforms with Garry Kasparov. Or Nigel Short. Of course it isn't easy to beat a crook and a buffoon in an election, otherwise Italy would have a different leader to the one it's got. But it would disgust me if people were seriously to entertain the idea of a breakaway from FIDE in which we divided the world into a mostly European elite on one hand and an Asian, African and South American under-people on the other. There is nothing about that which appeals to me: and the genuine motivation behind it wouldn't be a concern for democracy or good governance, but a desire to corner the market in high-profile and profitable chess events. The truth is that for some people at least, it's a business feud. The questions of ethics are a sideshow. Who would that chess world be all about? If Simpson's-in-the-Strand is any guide, it would be about hedge fund managers, tax exiles, celebs, chancers, cronies and Carol Vorderman. To be honest I'd just as rather take my chances with Kirsan. And I would much rather take my chances with Kirsan if the alternative involved fracturing the world of chess again and delivering this half of it into the hands of the charmless bunch who stood against him. Because there are cronies and bastards on both sides of the fence. Looking at some of Karpov's loudest British supporters, that much is obvious. I can't, I don't think, claim he means exactly what I would mean by it. But I would mean having something to say to the people who were being asked to replace the people who are Kirsan's placemen. And by definition, these would be very largely people outside Europe and North America. And again by definition, this would mean finding out what they wanted and needed from chess. But what, in fact, people have normally been saying about people outside Europe and North America is that these people have no value. They don't count. That would be a better idea. Better than Barry Martin and Carol Vorderman. It would be good. Of course it would be good. Of course, because it would be good, it isn't going to happen. That's a parallel universe. That's not the world of chess.